Shown below is the hotly-contested hunting ground west of Big Bend. Topography is from genuine USGS data, though differences in elevation are rather dramatically enhanced in this view. The town of White Rock was nestled at the western edge of Republic County, while Round Mound, the source of limestone for many area buildings, and the village of Lovewell, were both in Sinclair Township in Jewell County. The hay meadow along the Republican River below the White Rock (1) is where newly-arrived settler Gordon Winbigler was killed by a warrior’s spear in August of 1868. A few miles south of Round Mound lie the forks of Marsh Creek (2), where Thomas Lovewell and some hunting partners from Lake Sibley eluded Indians who were stalking them later that summer, when Lovewell and the others tried to scare up enough game to feed starving residents near Lake Sibley and Elk Creek in Cloud County. The terrain was not nearly as rugged as the map suggests, but there were many ravines deep enough to hide in. 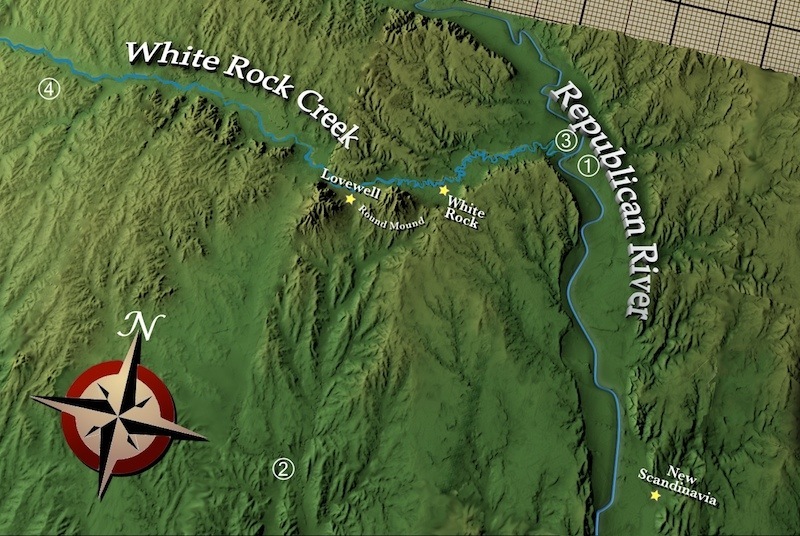 The mouth of White Rock Creek (3) was the site where a party of six buffalo hunters from Waterville were slaughtered by Cheyenne Dog Soldiers in May of 1869. The far western region of the map (4) was briefly the domain of the Excelsior Colony, founded by a group of craftsmen and mechanics from Brooklyn. The same group of Dog Soldiers who had killed the hunters, surrounded the Excelsior fort a few days later, giving the colonists second thoughts about their choice of where to settle. Many either fled to Republic County or returned home to Brooklyn. The town of White Rock quickly began to take shape by 1870. Streets were paced off a year later and the plat was filed in 1876. By 1878 it was the most active trade center in Republic County. Even in its heyday, only about 400 citizens may have called it home, but White Rock served a populous and thriving farming region and its streets were usually packed with customers in the early days. The development of the village of Lovewell did not get underway until 1887 when, snubbed by the railroads, White Rock was in a steep decline and the tracks of the Rock Island Railroad were being laid through eastern Jewell County. By 1915 Lovewell was being hailed as the fastest-growing town in the county. 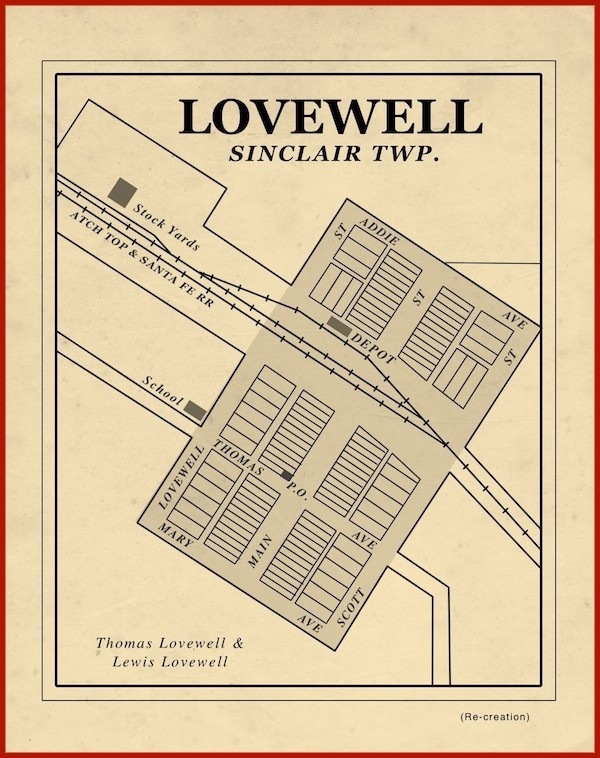 Lewis Lovewell, listed on the map as Thomas Lovewell’s partner, may have been a grandson of Thomas’s Uncle Lyman.